I haven't always been a huge fan of cream ales as they seem to sometimes be too cloyingly sweet but the Anderson Valley Brewing Company has a done a good job making their cream ale stand out from the others. This velvety ale has just enough flavor to let you know that a craftsman was involved in creating this brew but is sufficiently muted to enjoy as a session beer. So while this may not be my go-t0 beer to beat the summer heat it's not a bad beer in it's own right. So if you're looking for a good summer session beer this one is certainly worth a try. Appearance: The color is a soft amber with some red hues. The clarity is great as is the creamy two finger head that slowly relaxed to a thin film. Smell: The smell is pretty clean and simple. Toasted grains and mild hops subtly hit the nose with a nice sweetness that reminded me of breakfast cereal. Initial Taste: The taste is not too far off from the smell. The toasted grains give it a wheat-like yet sweet initial flavor. There is a subtle spiciness that helps add some complexity. What hops there are in this beer are heavily subdued and make themselves noticed only in the finish to help create a crisp aftertaste. Thoughts: I haven’t always been a huge fan of cream ales as they seem to sometimes be too cloyingly sweet but the Anderson Valley Brewing Company has a done a good job making their cream ale stand out from the others. This velvety ale has just enough flavor to let you know that a craftsman was involved in creating this brew but is sufficiently muted to enjoy as a session beer. So while this may not be my go-t0 beer to beat the summer heat it’s not a bad beer in it’s own right. 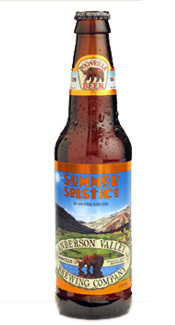 So if you’re looking for a good summer session beer this one is certainly worth a try.